Last Fall, my cousin Susan brought to my attention a recipe contest sponsored by Scharffen Berger chocolate. The Chocolate Adventure Contest required not only that Scharffen Berger chocolate be used, but also at least one ingredient from the following list: fresh mint (any varietal), fresh or crystallized ginger, pandan leaf, banana leaf, sumac, raw honey, cacao nibs, fresh or whole dried chili pepper, Malbec, peanut butter, black-eyed peas, rice flour, papaya, cumin, paprika (any varietal) and smoked sea salt. 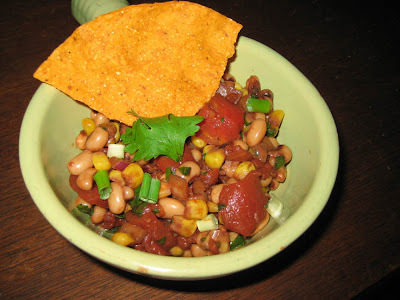 I figured a savory dish was in order and modified a recipe for chocolate salsa that I have used many times in the past, using chiles, black-eyed peas, cumin, and smoked sea salt from the "adventure ingredient" list. I also contemplated doing a variation of the black barbecue sauce with pulled pork and rice flour pancakes that I made here, but I didn't have time to play around and make the recipe my own. Here's the non-winning recipe, if you're interested. I mentioned it in this post from last October. Place black eyed peas, tomatoes, corn, scallions, bell pepper, 3 tablespoons of cilantro, shallot and garlic in a large bowl and toss gently to mix. In a smaller bowl, whisk together the chipotle, sugar, vinegar, cumin, salts, and cocoa powder until cocoa is thoroughly incorporated. Pour over vegetables and mix well. Refrigerate for an hour to allow flavors to blend. When ready to serve, sprinkle on remaining cilantro. Serve with tortilla chips as a dip, or as a side dish.